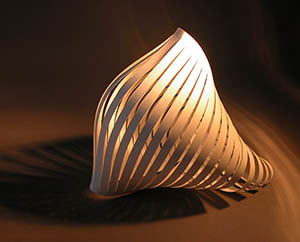 Three Dimensional Design seeks to expand your understanding of design theory as it relates to the 3 dimensional world. Working primarily in paper, bristol board, corregated board and fome core, we will explore concepts of modularity, sequence and series, relief, contour, structure and symmetry. We will examine the function of space, volume, mass, plane, and line. 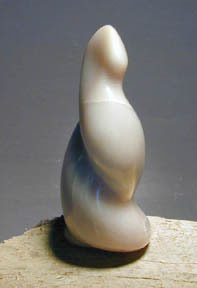 Sculptural issues will be explored through the solution of design problems. The main emphasis of this course is the development of critical thinking skills as they apply to three dimensional art forms and to help you gain a deeper understanding of visual art. This is a working studio course. Regular attendance is expected. Bristol board... scoring, cutting, joining, etc. 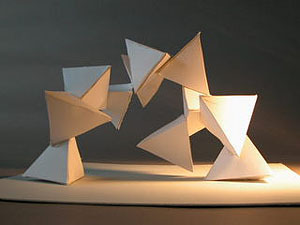 Large triangulated structures using newspaper struts. Layout and glue up each of the Platonic Solids and 2-3 Archimedian solids. 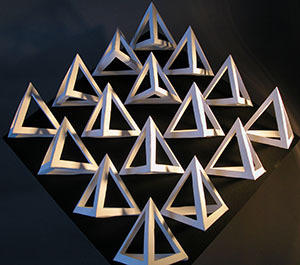 Construct a 12 – 16 unit sculpture using one or more of the forms above. Music video by Cyriak Harris for Bonobo Here Uses It uses clips from a 1962 film about the wonders of consumerism. as building blocks to create machines, robots, and other bizarre tableaus. Illustrates the use of mirroring, repetiton, rotation, etc as a design device. Bristol board high relief, modular grid of curvilinear, asymmetrical forms arranged in a close packed 16 - 25-unit grid on 16" X 16" mat board. 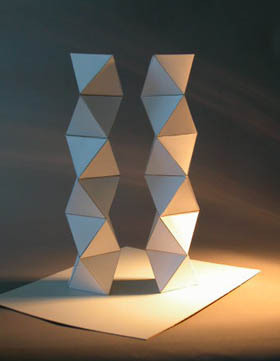 Bristol board parallel cut hyperparabolic and organic form(s). 2 –3 pieces. Curvilinear, wire screen, symmetrical, modular construction. 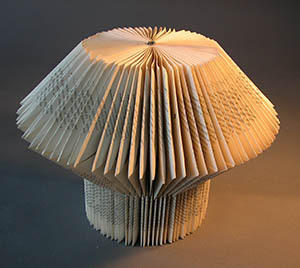 I'm a french creator of folded Books. My name Is Victoire LOO. e-Portfolio Assignment: All work created this semester will be photographed under studio lighting with a photographic backdrop and uploaded to Google Drive in a folder labeled 3D Design, Spring, 2015, "your name". Share the Drive folder with me by right clicking on the folder and choosing "Share". Enter jnevins@albertus.edu. Choose one or more of your best pieces to post in your e-Portfolio site along with a description of the project and how it explores the visual ideas discussed in class. Work found in your Drive will be one of the primary ways of assessing your accomplishments in this class. Academic Expectations: Attend all classes, care about your work, make progress in the medium, help and cooperate with your classmates, take risks, make mistakes. Your grade will be based on the care you bring to your work and the successful completion of each assignment. As this is a workshop class, good attendance is assumed. Attendence is crucial. A maximum of 3 absences is allowed. Materials: The instructor will provide the materials for this class, thus a lab fee of $50 is assessed to cover the costs of the materials used in the class. Bristol Board, 22" X 28"
The Golden Section Discussion of historical references in ancient Greece. "Through history, polyhedra have been closely associated with the world of art. The peak of this relationship was certainly in the Renaissance." The quadrivium—the classical curriculum—comprises the four liberal arts of number, geometry, music, and cosmology. It was studied from antiquity to the Renaissance as a way of glimpsing the nature of reality. Geometry is number in space; music is number in time; and cosmology expresses number in space and time. "Number, music, and geometry are metaphysical truths: life across the universe investigates them; they foreshadow the physical sciences. "